Take a break from this crazy stock market. Cash is king. Yesterday market closed in bearish zone and it was expected to sell off today but the future market reversed the chart again and it became bullish in the morning. S&P500 was up 12 points but it closed up3.5 point, and Dow was up almost 100 point before it sold off and closed up 19 point. This is now turning into pump and dump game. Stocks are pumped in the morning and by the close market sells off. Greece is still having problem to form government and now the talks are of temporary Government which would last for some week before another round of election is carried out. 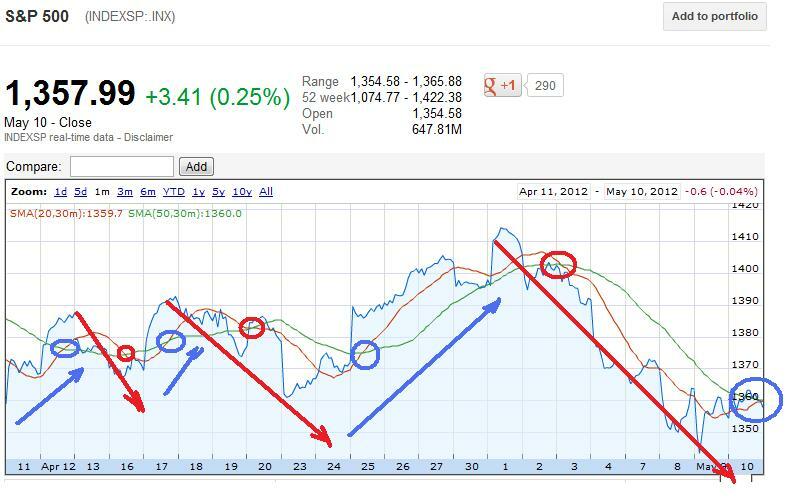 This is just disaster for Greece and World economy. Greece has deadline till May 17th to form a government. JPM shocked everyone by posting 2B loss in their trading portfolio which it used to hedge against risk the company takes against its own money. As a result company will now post a loss of 800 m in second quarter. This caused panic after hours and futures lost almost 110 points. At today close Dow and S&P500 are back in bearish zone and tomorrow market is expected to sell off but it would end up flat by close. Any negative news or rumor would only add fuel to fire when stock is in bearish zone. 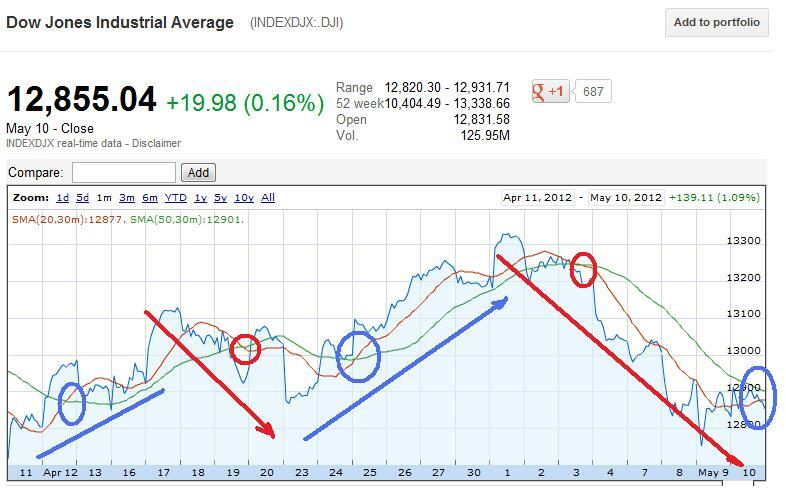 But this market is driven by future market, so the up trend or down trend would be set in the future market. The first level to check on Tomorrow in Dow for upside is 12908 followed by 12965 which is important break point for the upside. 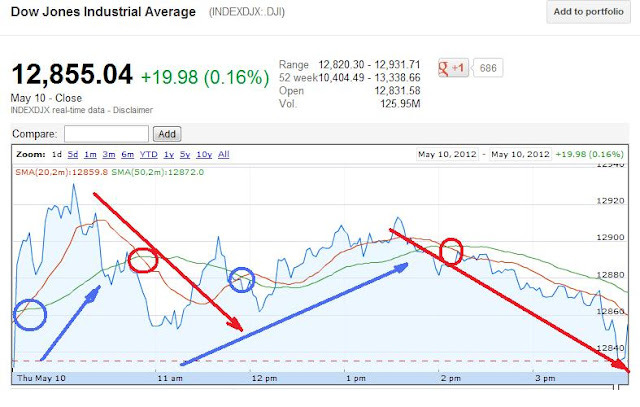 While for the downside, Dow needs to break 12748 followed by 13701. The first level to check on tomorrow in S&P500 for upside is 1364 followed by 1368 which is important break point for the upside. While for the downside, S&P500 needs to break 1348 followed by 1342. 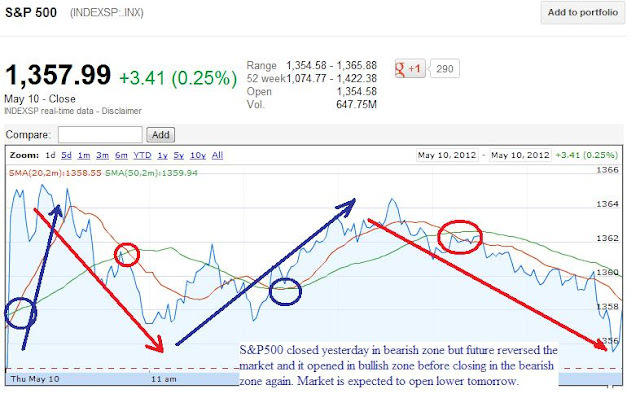 S&P500 at today's open, it opened in bearish zone but future changed the direction and it became bullish in the morning. 1 month chart is back in bullish zone, and so any pullback is a buying opportunity. Dow was also in bearish zone by yesterday close then futures reversed the direction and at the close dow is in bearish zone but it is expected to close flat at the close. 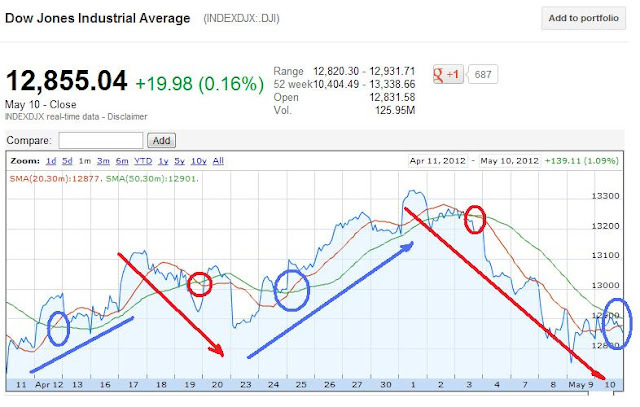 1 month chart of Dow is now bullish so any positive news could lead to bigger rally upside. For day trading watchout BIDU, AAPL, PCLN, MA, V, FAS, FAZ, TZA, TNA, TVIX, XIV, SVXY, UVXY, VXX, SPY, DIA, GLD, AGQ, INFY (remember volatility is not a long term investment option use it for strictly day trading) VIX is still in contango so any rally in it would lead to sell off at close. So becareful with UVXY, TVIX, VXX. Take a break and don't keep anything invested overnight. Cash is king. There is no point in chasing stocks at this overbought level.There will be plenty of opportunity Good luck.